sauteed with olive oil and garlic and tossed with pasta... top with parmesan. pancakes topped with goat cheese and Laura's oven-dried sungolds. insanely good! take off the green outer skin and then peel the tender white flesh to create raw "fettucine". Toss with pesto or other favorite pasta sauces. You'll be amazed! 1/4 slabs arranged on a cookies sheet greased with olive oil and then drizzled with a bit more on top. Sprinkle with pressed garlic, parmesan cheese, oregano, and salt & pepper. Bake until golden and bubbly. Delicious as a side dish, in sandwiches, and rolled up with a smidge of gorgonzola or goat cheese in the center. 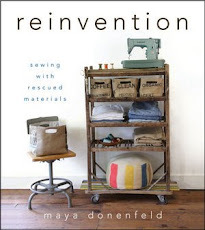 Haven't tried this recipe, but it's quite similar to one I've used in the past... and you can't go wrong with Zuni Cafe! I'd love to hear some of your favorites, too! 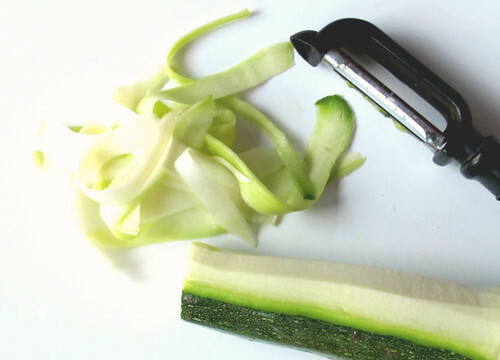 How do you make the most of zucchini abundance? Those pancakes look delicious - I'm going to try them this weekend. kelly- they're so good! I added some diced red pepper to the batch pictured in the post. Those pancakes look amazing. One of our favorites is Zuccanoes. Here's the link to my recipe: http://www.hidethecheese.com/hide_the_cheese/2009/09/zuccanoes.html. I have been cutting them into 1/4 inch thick sticks and sauteeing with butter, lemon pepper and lemon essential oil. but those grated pancakes with the goat cheese? lunch. and I make all my bread and butter pickles with zucchini and summer squash instead of cukes... way cheaper and just as good. and do you know about chocolate zucchini cake? steamed, fried, 2 kinds of muffins, quiche, fritters. It all looks and sounds amazing! I made this one a few weeks ago - so, so good. Last year we sliced a bunch up in half rounds and fried them in the cast iron pan until they were nicely browned. Then we froze several bags and used them throughout the winter to top pizzas- so yummy! I have never been a fan of zucchini. It started when I was young and thought I was biting into a cucumber and I wasn't! (shocked I was) I will tell you this recipe might change my mind! I will let you know! thank you for sharing! I'm loving your links and suggestions!!! Please keep them coming! Umm, love zucchinis, or squash, as they're called over here. I make pancakes that looks like yours, although the goat cheese (feta) is crumbled into the batter before frying. I also make a zucchini pie, which is a real kids favourite, also very good the next day in sandwiches. Uh, and grated in a spongy cake with lots of spices; cinnamon, ginger and clove.Yum, yum! The nuts really a special something something! 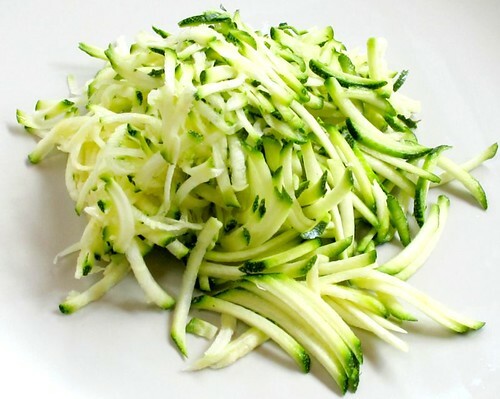 Can't wait to try your zucchini strips with pesto, that sounds GREAT! 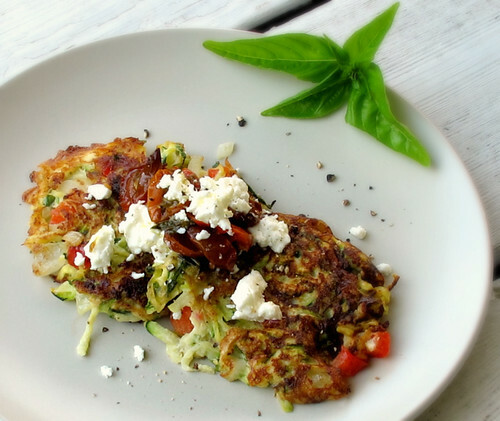 Oh my, I love zucchini and that dish looks de-lish! My husband makes pancakes with zucchini and whatever else is on hand, often including feta in them. Earlier this year he even grated a beet into a batch and it was fantastic. We like to dallop them with some pesto or chimichurri sauce. Another favorite is to slice them lengthwise fairly thin, grill, then spread with riccota mixed with a bit of lemon zest and juice, then roll up and sprinkle with some paprika. They make a great appetizer or take along dish for picnics. I LOVE the looks of you zuke cooking! Thanks for sharing your ideas. I make a zucchini Parmesan Cheese Pie. SO delish. I will be posting the recipe soon. yummiieeeee!!!! I often make soup with zucchini. Bake some zucchine very short, added water, and when it all boiled, than giev it a real creamy taste with french cheese with garlic, and onions....it's so yummie, and very quick and easy to do! We are so abundantly rich in zucchinis at the moment--thanks for the recipe ideas! They look great and I bet my kids will even eat those pancakes. I grate them, mix them with a bit of flour and egg, and saute them up for the kids as a super quick lunch. Also, no link, but - marinate zucc halves in soy sauce, splash of olive oil, garlic & grated ginger, then grill about 10 mins. Great as a side to fish. I love zucchini bread with chocolate chips. I also make Spicy Zucchini cookies. Yum! 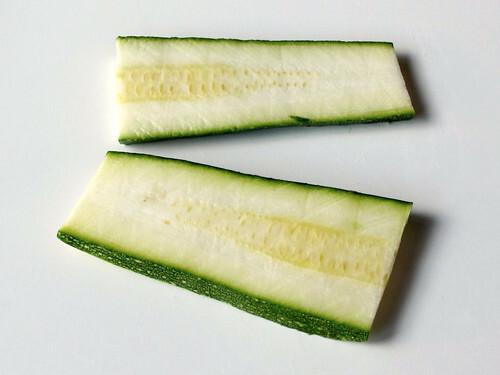 We have family coming to visit this weekend and I am going to cut the zucchini into slabs and cover with diced tomatoes with fresh seasonings and then mozzerella. oh boy, can i relate. for lunch i made the spinach and zucchini soup from 101 cookbooks. so delicious - and i used a whole zucchini! i think i'll eat it again for dinner, and probably lunch tomorrow. We just had the pancakes for dinner. So delicious and the WHOLE family liked them! Thank you. I live abroad in Italy and love the abundance of zucchine this time of year! One of my favorite way to eat it is as a substitute for roasted potatoes. This works especially well with those big overgrown zucchine whose seeds have grown hard. Just slice it up in 1 inch chunks and toss with salt, olive oil, and some dried origano. Then roast at a high heat in the oven for about 45 minutes. Goes great with grilled meats. Yummy! My favorite of course are simple: bread and steamed with a bit of butter melted on top. But these are great recipes and ideas you just gave me...too bad only one out of three zucchini plants we planted this year made it. Buaaaa! So there isn't much of an abundance around here, not like last year. How about butternut squash? Do you have any good recipes? I seem to have lots and lots of those waiting for me in the garden. My mother-in-law passed on the most delicious zucchini chocolate cake recipe to me--it is super moist and so fudgey and delish. We also use those big zucchini to make breaded zucchini parmesean (just like the eggplant version only with zucchini).